Hayes freshman Mary Grace Duffy delivers closing arguments to the judges in the case, played by local attorneys, Friday, Jan. 18. Duffy said she enjoyed participating in the competition and learning about how the court system works. 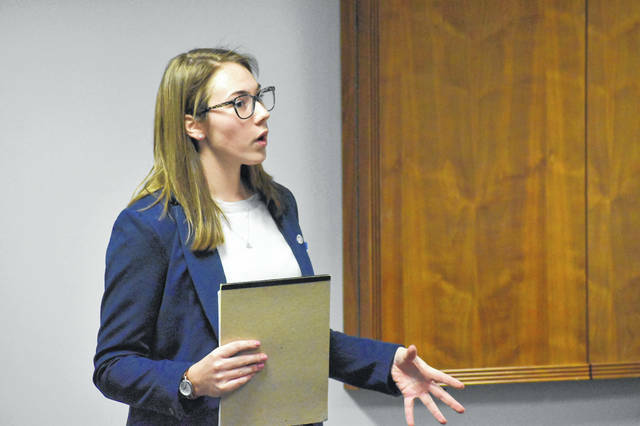 Hayes High School sophomore Mackenzie Collett cross examines a witness during the mock trial competition Friday (Jan. 18) at the Rutherford B. Hayes Administrative Building in Delaware. Collett played an attorney in the case and had to represent both sides throughout the day. Collett and other attorney competitors questioned witnesses, introduced evidence, objected, and gave closing arguments. The Delaware Hayes High School Mock Trial team is moving onto regionals after winning the trials competition Friday (Jan. 18) at the Rutherford B. Hayes Administrative Building in Delaware. During the mock trial competition, teams representing schools from Delaware County (Hayes, Big Walnut, Buckeye Valley, Village Academy and Westerville North) and three schools from outside the county (Whetstone in Columbus, Dublin Jerome and West Liberty-Salem) portrayed lawyers and witnesses in a case and were judged on their knowledge of the legal system and execution during the case. Delaware County Common Pleas Judge David Gormley coordinated Friday’s (Jan. 18) event and said the teams had to represent both sides of a fictional case. This year, the case centered around a criminal defendant challenging the admittance of a piece of the state’s evidence. Gormley said in the fictional case, a privately operated drone appeared to show the defendant outside next to a notebook with incriminating evidence written on it. Gormley said the participants had to focus on the defendant’s reasonable expectation of privacy and if the drone operator is a state actor. “It’s quite realistic,” Gormley said Friday. Gormley added that suppression hearings like the one in the fictional case are common and take place in a “critical stage” of criminal proceedings. Gormley said he believes the mock trial competition does more than just introduce students to the legal system. Gormley added he’s coordinated the program for many years, because he wants student to have the opportunity to learn and try something new. Gormley said he’s also happy to encourage students to look into legal work. Mary Grace Duffy, a junior at Hayes, and Mackenzie Collett, a sophomore at Hayes, played attorneys in the group and had to question witnesses and learn when and how to object to their opponent’s moves. Duffy said she was “enthusiastic but intimidated” about the competition. Aidan Ferguson, a sophomore, was on the team Friday and played a witness in the case, meaning he had to be questioned by both his team and the other team’s attorney. Ferguson said he’s an actor and enjoyed playing the part. “I read the testimony to take on the role, but it’s interesting to have to think on your feet,” Ferguson said. Another witness on the Hayes team, Jamie Hake, said she is not an actor, and the role playing aspect was a challenge for her, especially when she was being questioned by other teams. Hayes won both trials Friday and have advanced to the regional competition on Feb. 15, along with the team from Buckeye Valley, the team from Village Academy, and one of the two teams from Westerville North. The state finals are March 7-9 in Columbus. Gormley said the annual high school mock trial competition is sponsored by a nonprofit organization called the Ohio Center for Law-Related Education (OCLRE), which in turn is funded by the Ohio State Bar Association, the Ohio State Bar Foundation, the Ohio Attorney General’s office, the Supreme Court of Ohio, and the ACLU of Ohio. OCLRE also offers other programs designed to motivate young people to learn more about civics, government, and the law. 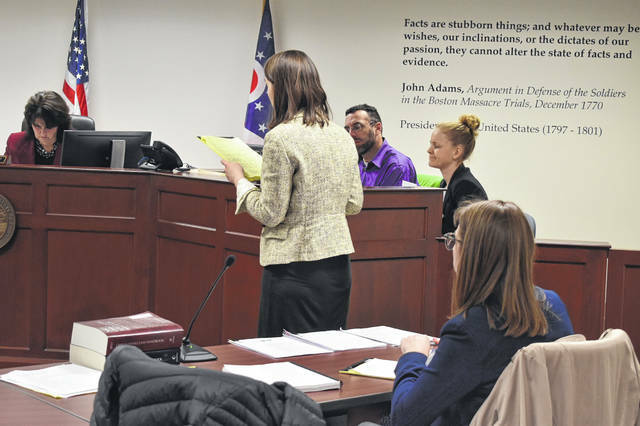 COLUMBUS (Jan. 18, 2019) – More than 3,000 high school students entered courtrooms across the state on Friday, January 18, to take part in the Ohio Center for Law-Related Education’s (OCLRE) 36th Annual Ohio Mock Trial Competition. The Ohio Mock Trial District Competition is hosted in 26 counties throughout Ohio. Teams that advance from the District Competition will compete in the Regional Competition on February15. Regional winners will compete in the State Competition on March 7-9 in Columbus. The 2019 state champion team will represent Ohio at the National High School Mock Trial Championship in Athens, Georgia, May 16-18. OCLRE is a non-profit, nonpartisan organization whose mission is to improve society by developing citizens empowered with an understanding of our democratic system. OCLRE is sponsored by the Supreme Court of Ohio, Ohio Attorney General, Ohio State Bar Association and the American Civil Liberties Union of Ohio Foundation. The Ohio Mock Trial program is made possible, in part, by a grant from the Ohio State Bar Foundation. For more information about OCLRE and its programs, visit www.oclre.org.